And with that, the lights dim and on walks the energetic and diverse cast. 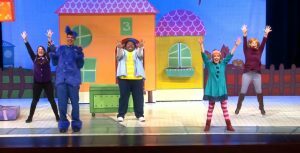 First comes Peg, played by the zippy Amber Dickerson, who has a high, fun voice that the kids in the audience resonate with. Next comes her partner in crime, the Cat, played by a very tall, Zachary Hasbany, who slinks around the stage like a Russian Blue. It’s when Mom—the versatile Leah Sanginiti–enters that we start to understand the premise. 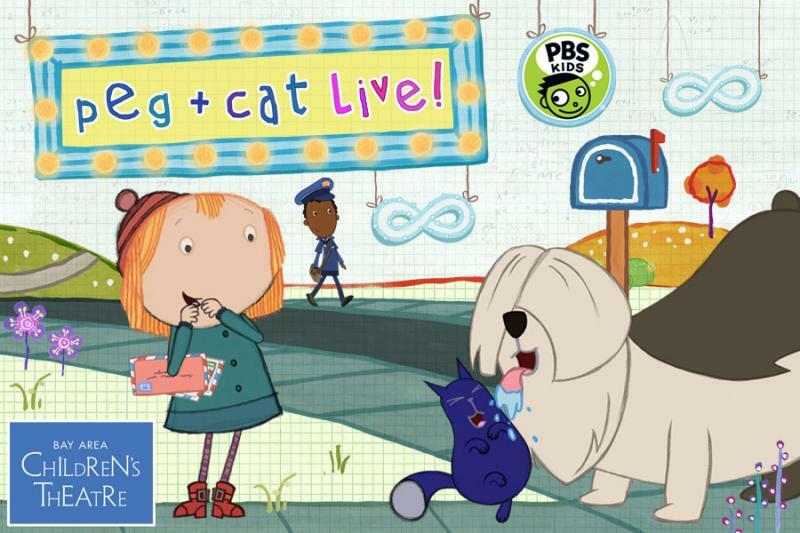 Peg and Cat have to deliver some very important letters to the mailbox. There is a very big dog between them and that mailbox. 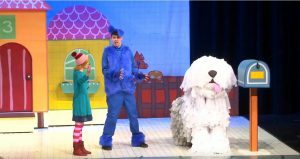 Really, the dog is a highlight—a gigantic, white puppet with a woman inside, Brittany Law, who somehow manages to evoke all kinds of emotions. She scratches, jumps, nuzzles, reels back in surprise, and even licks her chops. I found myself wondering just how she had arranged herself inside the puppet. It’s a feat to behold, for sure. If you want proof that this show is worth catching on its current national tour, know that my squirmy 11-month old, River, sat through the whole thing on my lap, transfixed and delighted by the movement, colors, characters, and music. And Itasca now has a new favorite PBS show. But no matter that it’s an adaptation. I’d watch the live, theatrical version by Bay Area Children’s Theater any day. Cast: LaDareon Copeland, Zachary Hasbany, Leah Sanginiti, Amber Dickerson, and Brittany Law.